Lepide DC Monitor tool is an effective and simple freeware that helps the administrator to monitor and evaluate state of Domain Controller and its performance. The tool is designed to run an automatic series to report state of Domain Controllers and their performance.This software can be used to analyze the state of Domain Controllers within an organization, all Domain Controllers within a site or a single Domain Controller. Pertaining to the user-specified input about the Domain, for which the details are required, comprehensive information like CPU utilization, Memory Utilization and Disk Utilization are extracted. In addition to the above mentioned key constraints, user can also view details of other parameters such as Page Reads/sec, Page Writes/sec, NTFRS Handles, File Reads/sec, File Writes/sec etc which might be required by the administrator. 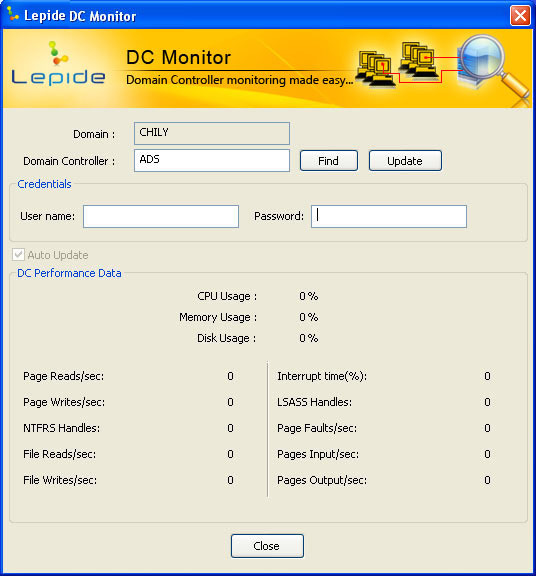 Lepide DC Monitor software has made Domain Controller monitoring easy. This software determines the state of Domain Controllers and its performance the user types his/her credentials for a particular Domain Controller within a Domain. Owing to its advanced design, Windows administrator can monitor many domain controllers at a time however, he/she needs to provide login authentication for each DC. How to Use Lepide DC Monitor? Qweas is providing links to Free Lepide DC Monitor 10.12.01 as a courtesy, and makes no representations regarding Free Lepide DC Monitor or any other applications or any information related thereto. Any questions, complaints or claims regarding this application Free Lepide DC Monitor 10.12.01 must be directed to the appropriate software vendor. You may click the publisher link of Free Lepide DC Monitor on the top of this page to get more details about the vendor.